Small town talent show winner and devout Baptist Marla Mabrey (Lily Collins) arrives in Los Angeles, gaining a contract under the legendary Howard Hughes (Warren Beatty). Once she arrives, she is introduced to Frank Forbes (Alden Ehrenreich) who would work as the young actress' driver and the pair hit it off instantly. However, both have strong religious beliefs as well as Hughes rule that no worker may have an intimate relationship with a contract actress, forbidding them from being together. The last film that Warren Beatty directed, wrote and starred in was nineteen years ago with 'Bulworth' which he gained an Oscar nomination for Best Original Screenplay. Beatty has had a great career in film, succeeding on so many levels with different aspects of filmmaking. However, it is a total shame to say that Beatty is the main reason that 'Rules Don't Apply' is not a success. 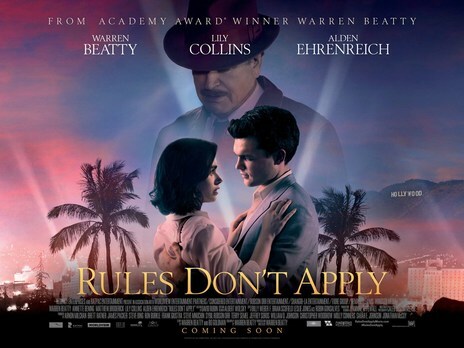 If you have seen the trailer for 'Rules Don't Apply', you would see that the film is advertised as romance film between Lily Collins and Elden Ehrenreich's characters. Although this is still an element within the film, it is, in fact, a very small aspect of the story. The film does actually start off with a focus on the relationship between Mabrey (Collins) and Forbes (Ehrenreich) but it is soon moved to the side for Beatty as Howard Hughes to come in and be the main character of the film and turning the film into a biopic of some sorts. The film starts off with Marla first coming to Los Angeles with her mother, wide eyed with high hopes and she is soon introduced to Frank Forbes and Levar (Matthew Broderick) who will work as a driver for her whenever necessary. The rules for the drivers is that they are forbidden from having intimate relationships with any of the contracted actresses, creating a conflict and a barrier for the two protagonists to battle against. As the film starts to develop the relationship between the two, Collins and Ehrenreich's chemistry shines, engaging you into the film and makes you care for the two characters. The scenes where the two are onscreen together are by far the most enjoyable as the film plants the seeds early on for the two and you expect the film to just flourish from then on. This is until about twenty minutes in when Howard Hughes is introduced into the story. As Hughes (Beatty) is introduced, the film slowly and gradually becomes more and more frustrating as the focus moves away from the two characters you were invested in early on. Beatty takes the spotlight and runs away from it but not in a good way, as the story changes into a telling of the latter years of Hughes life, where it was questioned whether he could function on his own or not. This takes centre stage and despite Beatty being fine in his performance, it is nowhere near as interesting as what was shown in the first twenty minutes and in the trailer. 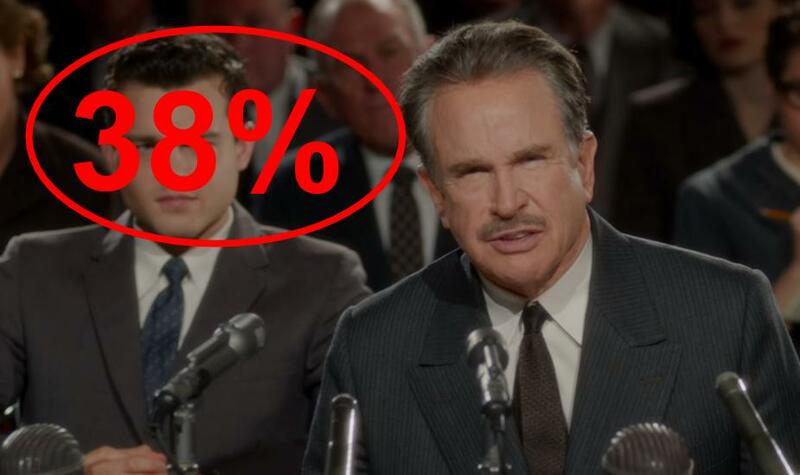 Warren Beatty seemed to be on a mission to make sure that everybody knew that he had an impact on this film. Despite being the writer and director, Beatty cannot hold himself back from completely messing the film up in what can only be described as Beatty going mad with power. There are a couple of decent moments involving Beatty such as the long ongoing shot with himself and Ehrenreich exchanging small talk to one another which does show that he does possess great talent. But the problem is that he wants to be the star of everything. He meddles too much with the film and it takes you away from what you want to see in the film. It seems like Beatty wanted everyone to know that this was his and only his film. The film could've and should've followed the relationship between Collins and Ehrenreich but it, unfortunately, does not. We get treated to over an hour and a half of Beatty holding business partners up and showing glimpses of dementia. The rest of the cast is then resorted to simply playing second fiddle as the film abandons its best parts, all so Beatty can be the star. It's not very often that you see a creator become so madly in love with themselves and put themselves in the forefront despite the film's best interests. This is a project that's only intention is to make Beattrelevantnt in todays society after years of inactivity. He would've done just that if he had just took a step back and just wrote and directed a competent romance film. Beatty is charming enough to even play a good side character who can help the film progress, instead, he completely destroys it. 'Rules Don't Apply' is a frustrating mess as early on, it has the potential to be a worthwhile watch. However, it doesn't continue that and instead is as clear a vanity project you'll ever see. Other than the clear meddling, the film does well to capture the old Hollywood feel, with its cinematography, setting and costumes playing a big role in doing so. The film is really easy on the eyes with everything looking great in what is the most consistent part of the film. As far as the acting goes, there is no real problem with any of the characters. Matthew Broderick provides great support as does Beatty's wife Annette Benning, bringing some great scenes amongst a cast mainly much younger than themselves. The experience shines through from these veterans who showcase their talents with limited screentime but lasting impact. A return after many years is, unfortunately, a disappointing one. This could've been so much more but it is a frustrating mess of a film. An egotistical power trip does not make a good movie and hopefully, those involved will not be harmed too much by it as they are not the problem with this film. So have you seen 'Rules Don't Apply'? If so, what did you think of the film? I hope that this review was useful for if you were planning on seeing the film or not. Once again, thank you for taking the time to read my blog, it is much appreciated!